On April 15, eighteen members of the Meiji University Museum Friendship Society “Meiji University Museum Naito family document study group” visited the Institute in order to observe the Institute’s facilities. They toured the Library of the Department of Art Research, Archives, and Information Systems and the Conservation Laboratory and the Biology Laboratory of the Center for Conservation Science and Restoration Techniques. The Department of Art Research, Archives, and Information Systems held its first seminar of 2013 on April 30. Research presentations were given on Hananokage (Illustrious Portraits), a Private Photography Magazine for Nobles, and Letters from OGAWA Kazumasa to KURODA Seiki. Presentations were made by SAITO Yoichi (Tojo Historical Museum, City of Matsudo) and OKATSUKA Akiko (Edo-Tokyo Museum, Tokyo) along with TANAKA Atsushi. 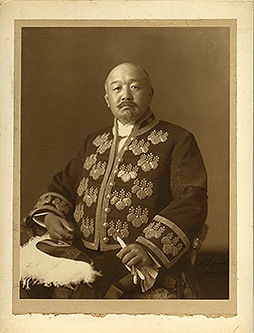 Starting off, Mr. SAITO described results of his previous studies of Hananokage (published from 1903 to around 1908), a private photography magazine published by former daimyo (feudal lords) such as TOKUGAWA Yoshinobu and TOKUGAWA Akitake, i.e. Meiji-era nobles. Based on his studies, Mr. SAITO deduced that 4 volumes of Hananokage were published each year. Mr. SAITO focused on 5 editions published between March 1907 and March of the following year that featured Photography Critiques of submitted photographs authored by KURODA Seiki and photographer OGAWA Kazumasa (1860–1929). Based on these Photography Critiques, Mr. TANAKA appraised KURODA as an artist and OGAWA as a photographer, and Mr. TANAKA also described KURODA’s views on “photography.” Letters addressed to KURODA Seiki curated by the Institute include letters (7) from OGAWA Kazumasa. Ms. OKATSUKA is studying OGAWA based on these letters, and she described the relationship between KURODA and OGAWA. She also described the world of Meiji photography based on OGAWA’s relationship to nobles of the period. Plans are to publish the results of this research in vol. 411 of Bijutsu Kenkyu (The Journal of Art Studies) (scheduled for publication in Nov. 2013) and in subsequent volumes. This year marks the second year of Research Exchanges between Japan and South Korea in relation to the Safeguarding and Preservation of Intangible Cultural Heritage. The Department of Intangible Cultural Heritage conducted exchanges with South Korea’s National Research Institute of Cultural Heritage. In April, researcher Ms. Gyeong Soon HWANG of South Korea’s National Research Institute of Cultural Heritage visited Japan, where she studied Yuki-tsumugi in Ibaraki and Tochigi Prefectures. Since Yuki-tsumugi was inscribed on UNESCO’s 2010 Representative List of the Intangible Cultural Heritage of Humanity (Representative List), efforts have made to conserve the technique through culture, industry, and tourism. 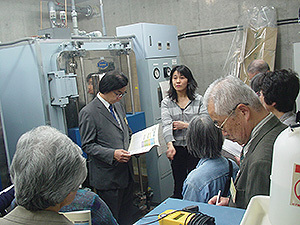 The study of Yuki-tsumugi included group interviews with conservators, administrators, and other personnel, and the study also enhanced discussion of the basis for preserving Yuki-tsumugi. Results of the research exchanges, which lasted 2 weeks, were presented at a seminar. The seminar highlighted differences in Japanese and Korean policies regarding and views of intangible cultural heritage. Science for Conservation is a research bulletin published by the Center for Conservation Science and Restoration Techniques and the Japan Center for International Cooperation in Conservation. Every article in Science for Conservation since its first volume has been converted into PDF format, and these articles are now available via the Center for Conservation Science and Restoration Techniques’ website (http://www.tobunken.go.jp/~ccr/pub/cosery_s/consery_s.html). All 4 papers and 22 reports featured in vol. 52, the bulletin’s latest edition, have now been uploaded. A pamphlet and 3 posters on biodeterioration and pest control are also available online, so feel free to have a look. (http://www.tobunken.go.jp/~ccr/pub/publication.html#002). Copies of many publications are distributed to relevant institutions. In order to provide useful information a larger number of personnel working to conserve cultural properties, however, plans are to actively make those publications available online.